CNG has long been regarded as a cleaner and more economical fuel than petrol, and cars have been using it as a propellant for almost two decades. Now though for first time, you can have a CNG kit retrofitted on a two-wheeler. Lovato, an Italian component manufacturer, has launched CNG kits for scooters in Mumbai in association with Mahangar Gas Limited. Having received approval from ARAI, Pune as well as ICAT, Delhi, this kit is compatible with 18 different scooter models from Hero, Honda, Mahindra, TVS, Suzuki, Vespa and Yamaha. What we have here is a Honda Activa 3G fitted with one of these kits. How different does it look? If you peel off the stickers, there isn’t a lot that hints that this scooter runs on CNG. The kit consists of two CNG cylinders with a combined capacity of 1.4kg which are located behind the apron. However, Lovato has done a good job of camouflaging the cylinders with a plastic panel that makes it looks like an exceptionally large glove box. This panel has an opening which shows the pressure gauge of the cylinders, basically acting as a fuel gauge. A part of the underseat storage is taken up by the CNG kit, the plumbing for which runs from under the floorboard. The filling valve peeps out from under the plastic panel, obstructing your foot. However, Lovato is already working on relocating this valve to improve convenience. Installing the CNG kit takes four hours. As the Honda Activa 3G is carburetted, you can directly crank the engine on CNG unlike fuel-injected vehicles. A switch next to the choke allows you to toggle between petrol and CNG. However, the kit doesn’t support switching fuel supply on the fly. You have to kill the engine, switch the fuel supply and then start it again. The Lovato CNG kit cuts hydrocarbon emissions by 75 per cent and carbon monoxide emissions by 20 per cent. Besides, the 1.4kg capacity of the cylinders gives the scooter a range of 110km, which roughly translates into running costs of around Rs 0.6 per km. This is half the running cost of a standard Activa 3G which is around Rs 1.2 per km. The trade-off, Lovato claims, is a five per cent drop in performance. A brief ride around the city showed that the scooter indeed has lesser grunt off the mark, though it became less significant as the scooter picked up speed. 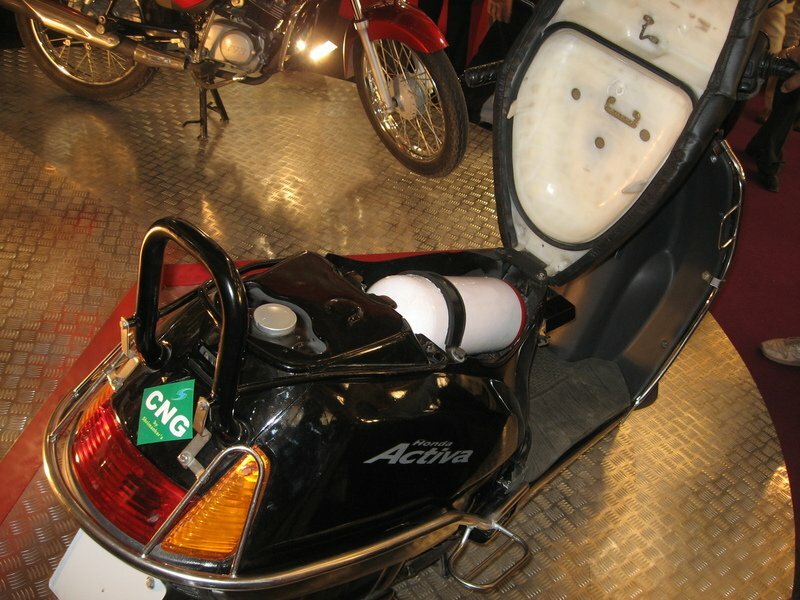 A part of drop in performance can also be attributed to the additional 14kg bulk of the CNG kit that the scooter has to lug around. Lovato claims that there is no change in the service interval of the scooter’s petrol engine. The CNG kit though, must be inspected for leaks and recalibration biannually. The cylinders have a life of 20 years, though a check once in every three years is recommended. You can have the CNG kit inspected and serviced from any of the 20 Lovato outlets in Mumbai and neighbouring areas. It goes without saying that you lose company warranty when you retrofit a CNG kit. Lovato offers a one year warranty for the CNG kit. You can have the Lovato CNG kit installed on your scooter for Rs 15,000. An additional Rs 1000 has to be spent for RTO registration and paperwork, all of which is taken care of by Lovato. One of the reasons for it being so expensive is that while the cylinders are sourced locally, the kit has to be imported from Italy and attracts heavy custom duties. So from a purely economic point of view, the Lovato CNG kit does seem like an expensive proposition, although the running costs mitigate that somewhat. However, the CNG kit is not just about being frugal, it is also about protecting the environment. While there is no shortage of electric scooters in the market, the Lovato CNG kit gives you the option to move around with a tankful of petrol, eliminating the phobia of running out of juice and getting stranded. In fact, the additional range of the CNG kit only increases the usability and convenience of the scooter.